At Lenora's Legacy, we are pleased to offer the flexibility to design the event of your dreams. We can graciously host events ranging from intimate gatherings of 25 individuals all the way up to large outdoor weddings with 350 people. Your wedding or special event will be the only event of the day to ensure that it is not rushed. We believe that each and every wedding, rehearsal dinner, charity benefit, or other event is special and it is our pleasure to help make your event a dream come true. We maintain a list of excellent local caterers whom we recommend. You also have the freedom to choose your own caterer, if you prefer. In addition, we welcome DIY catering, for those who wish to self-cater their event. You may select your other vendors such as musicians, florists, photographers, and videographers from our list of qualified local providers, or bring in another vendor of your choosing. Tables, chairs, linens, and other rentals are available from select caterers, as well as from nearby rental companies. All vendors must be bonded, insured, and have workers' compensation insurance. 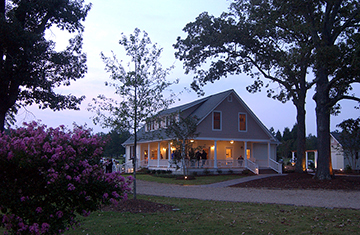 Wedding day rental includes use of the house, pavilion, and grounds for 10 hours, including time for the bridal party to dress. (Vendors may set up before the event at no additional charge.) All events must end by 10pm, due to noise restrictions. Additional rental hours are available at a rate of $150 per hour, as long as the event will still conclude by 10pm. Two hours for the ceremony rehearsal the day before the wedding are included in the wedding package. Additional rehearsal hours are available at a rate of $150 per hour. Includes use of the grounds and the farmhouse. 3 hours on weekdays or Sundays only. A 50% deposit is required to book the facilities, with the balance due 90 days prior to the date of the event. A security deposit is due 90 days prior to the scheduled event. It will be refunded (less any damage charges or corrected guest totals) two weeks after the event. A $500 deposit is required for groups of less than 100, and a $750 deposit is required for groups of 100 and over. Celebrations that include alcoholic beverages (only permitted if served by a licensed caterer) will be currently charged an additional $25 per hour for security guard(s),but may increase in the future. One guard is required for 100 or less guests. A minimum of two guards is required for weddings with over 100 guests. Additional fees are due 90 days before the event with the security deposit. Checks should be made payable to Lenora's Legacy. The 50% deposit should be sent at the time the reservation is booked. The balance, security deposit, and any additional fees are due 90 days before the event. At this time we do not accept credit cards. We would be delighted to give you a tour of the farmhouse and the estate. Please call to schedule an appointment for a private tour. We look forward to helping you plan your dream wedding or event!